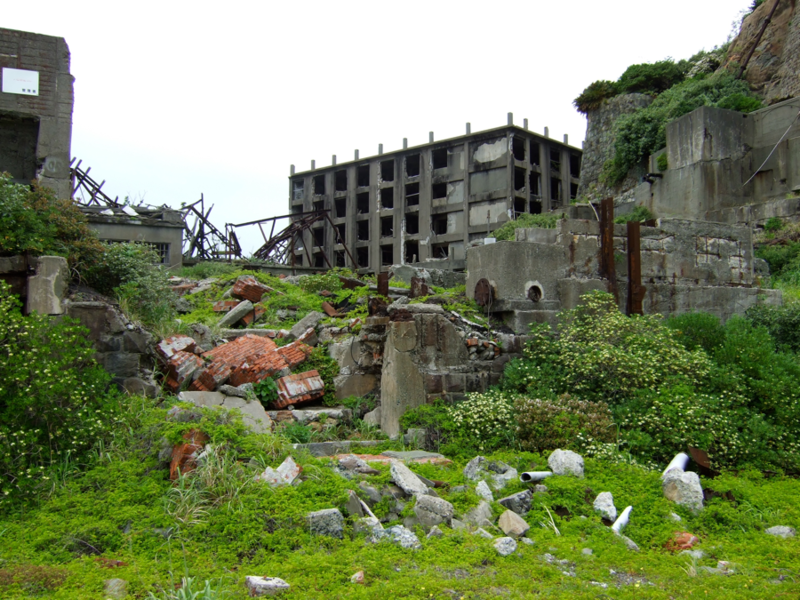 Gunkanjima is a dream island destination for people who prefer their holiday islands dark, forbidding, and a little scary. People like me. So one thing I had to do in Kyushu was visit Gunkanjima, or ‘Battleship Island’, about an hour off the west coast of Nagasaki. Again, a little backstory is necessary. 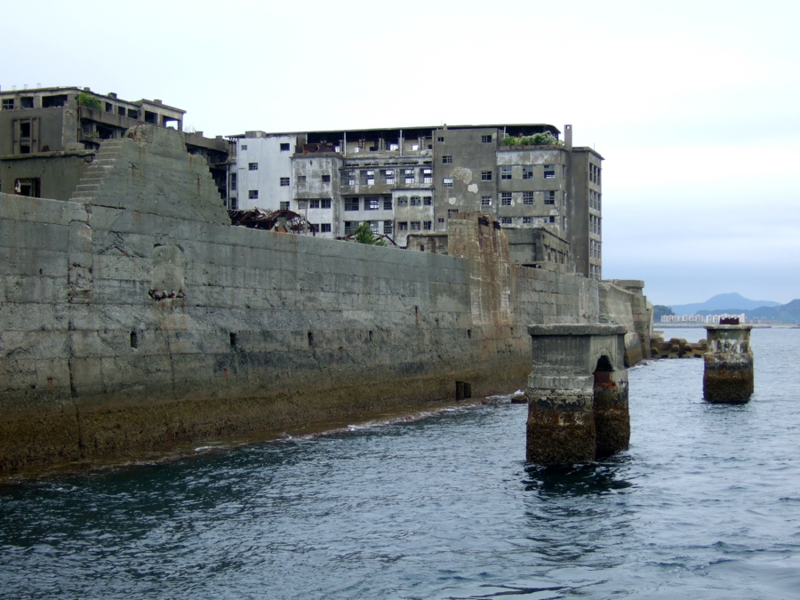 The island’s real name is Hashima, but with its concrete buildings and 12 meter sea wall it really does look like a massive battleship on approach, so these days it’s more famous under its nickname. It was once a thriving coal mine with a resident colony of miners, managers and their families. So thriving, in fact, that in the 1960s it was the most densely populated piece of land in the world, with a population of around 5,000. On a 15-acre island. It wasn’t even all land–the island itself was a steep rock rising out of the ocean and the flat space was the concrete skirt they’d built up around it since the late 19th century. It wasn’t economical to ship workers there every day and landing conditions were unreliable, so they built a city for everyone to live. Almost every convenience you’d find in a regular city was there, in smaller form. There were shops and restaurants, schools, a movie theater, a hospital and even a swimming pool (though from the films I’ve seen, the local kids preferred to just dive off the other side of the sea wall and into the ocean. Japan shut down its coal mines as oil took over, and by 1974 there wasn’t any point maintaining such a large population on a difficult-to-land-at island just an hour away from Nagasaki. They evacuated everyone and their families to the city and left the island as it was, empty and with no further purpose. In less than a few weeks it went from a concrete jungle teeming with traffic and activity to a concrete jungle in the middle of nowhere, with no life whatsoever. 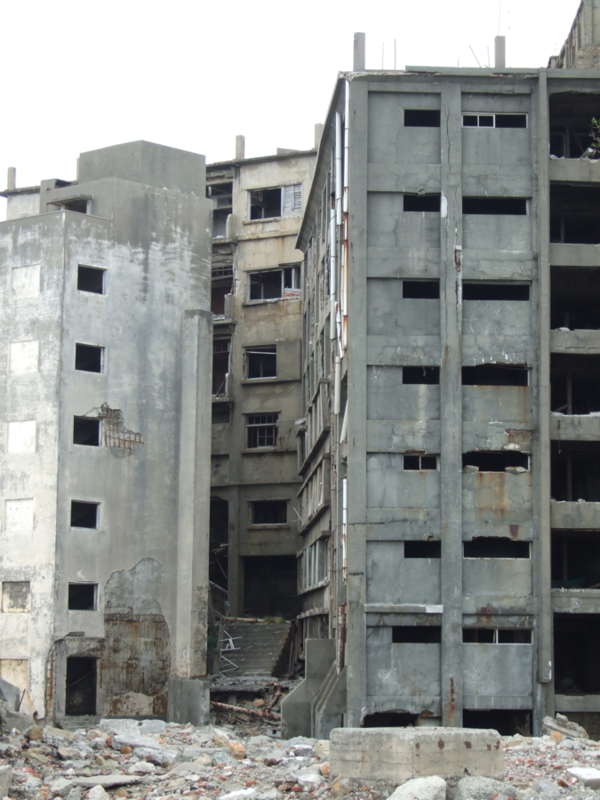 The place is exposed, windswept and susceptible to typhoons and storms, so you can imagine what happens to an unmaintained city in that position. Almost no-one bothered to go there for two decades. It turned from living city to scary ruins in a short period of time. Most buildings are in a poor state and many have collapsed. Visitors have been fascinated to find, like other hastily-abandoned towns such as Pripyat, that there’s still a lot of possessions and fittings there to remind them of the former inhabitants. Around the beginning of the 00’s, photographers rediscovered Gunkanjima and Shinichiro Kobayashi published a coffee table book that captured everyone’s imagination (there have since been more). 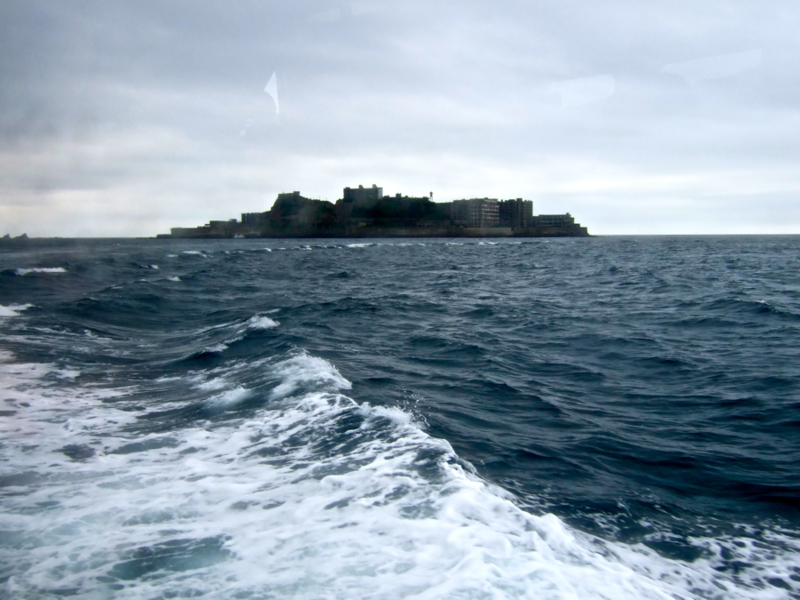 Since then other, much braver photographers and bloggers with better cameras than me have been there, sneaking in between tours or landing in the years before the island was refitted with safety features for tourist traffic. They climbed inside the ruined multistory buildings and photographed the infamous ‘Stairway to Hell’, along with the apartments and businesses frozen in decrepitude, and almost always the same old TV set. My time and transport options were more limited, and I have fewer cojones than I’d like. 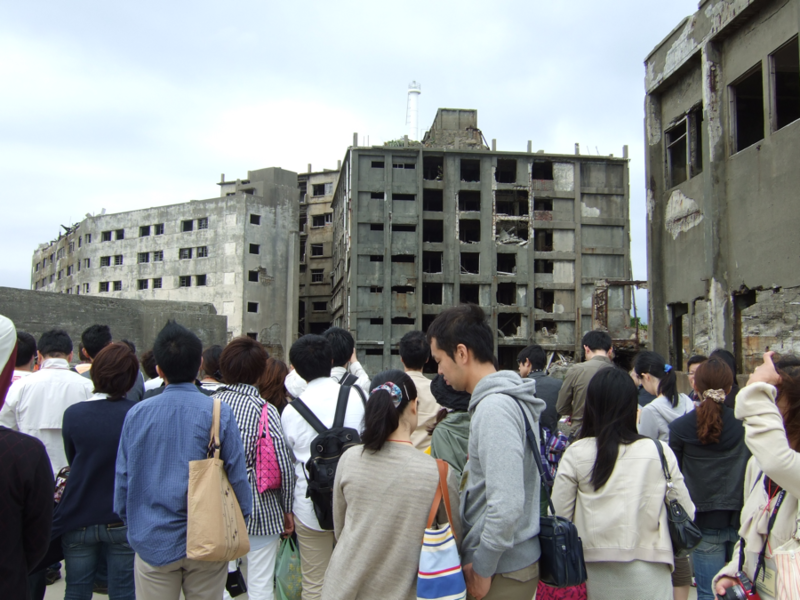 Plus, since Gunkanjima regained its fame and even applied for UNESCO World Heritage listing, you don’t need to be bold. 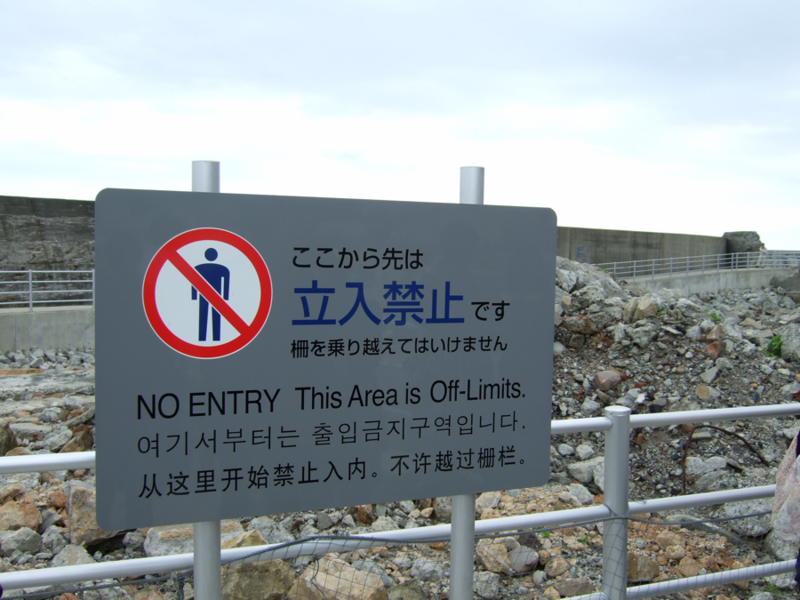 Since 2009 there have been official landing tours for 4000 yen, good enough to get my feet on Gunkanjima and add reality and scale to all those photos I’ve been drooling over on the internet since 2004. 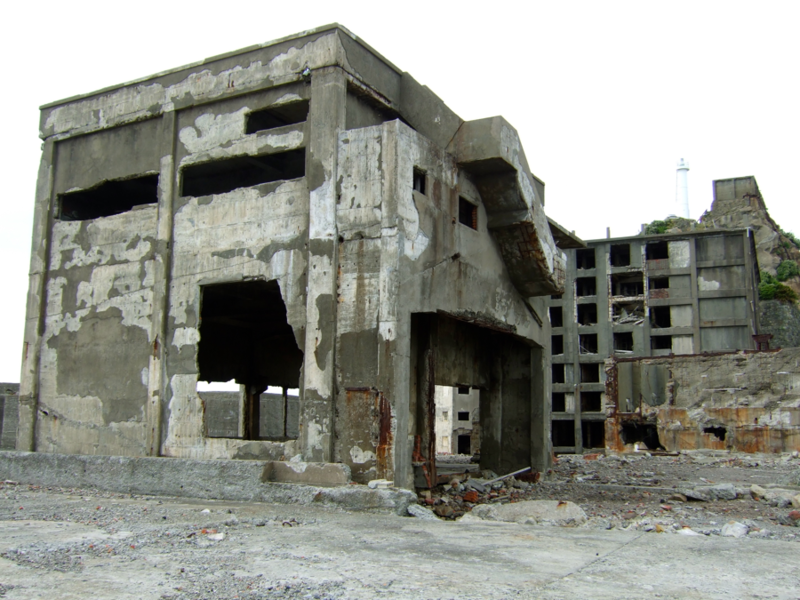 My only regret really was that I’d never experience Gunkanjima’s eeriness the way it should be experienced: alone, and with the sky getting dark and stormy. And with my only transport to the mainland dashed upon the rocks. And a strange groaning coming from deep inside the… OK, stop. On the contrary, if it’s at all dark or stormy the tours won’t even land, so the conditions were as calm and unthreatening as could be. And as you can probably imagine, all the most photogenic (ie: scary) parts are also the most dangerous, so you don’t get to go there. Really, there’s a better than average chance one of the buildings could fall down on you and there are prominent collapsed floors and walls to remind you. The tours take a much safer trip around the less built-up end of the island. You do get to see the old swimming pool (now just a hole in the ground) and some of the mining operations, and you get within good photo-shooting distance of some of the ruined multistories. The ruins, in their frightening way, are beautiful. That’s something only lovers of abandoned buildings will appreciate. The kind of people who would hide under the seat of a New York subway to check out the abandoned City Hall station on the turnaround loop (I confess, I did that once) and the kind of people who are always the first to die in horror movies because they go into that awful, demonic-looking farm house. Gunkanjima’s buildings definitely have that air of menace but, on a sunny day and viewed from a distance with a hundred other tourists, it’s about as safari as looking at lions across a moat at the zoo. I admit I spent a few seconds pretending I was alone, trying to picture myself as a character in one of those sinister but fantastic post-apocalyptic movies like Nineteen Eighty-Four or Threads. I even managed a shudder, so money well spent in my view. Looking at the photos I took, you’d be forgiven for thinking I’d visited some ordinary abandoned industrial site. Except that it’s surrounded by water and too far to swim back to shore, and that its story might be good enough to get World Heritage listing. It’s a great place to go if once-throbbing, but now forgotten, places are your idea of interesting.